Located in the front room of the Maple Ridge Museum, our temporary gallery rotates exhibits every six months. The goal of the space is to highlight parts of our collection that do not necessarily fit into the exhibits currently on display. The space is also used to showcase traveling exhibitions from neighbouring museums. Currently on display is “The Cure-alls that Cure Nothing: A History of Patent Medicine.” Patent medicines were neither patented nor medicine as we would view them today. The “patent” comes from the 18th century concept of a “Royal Patent” given to those that had the backing of a royal investor. 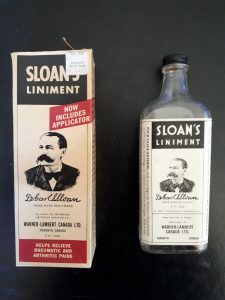 Most popular in the late 19th century, they were peddled as medicines by the charismatic door to door salesmen who were off to make their fortunes off of communities that often lacked a doctor, including early Maple Ridge. These “medicines” were advertised as containing healthful ingredients like herbs and vegetables, but more often included high percentages of alcohol, opium, and cocaine. The history of patent medicine is the history of advertising, as snake oil salesmen convinced unsuspecting people to purchase their unhelpful and often highly addictive compounds. The exhibit explores the history of this curious medical practice and displays our fantastic collection of patent medicine bottles, boxes, tins, and advertisements. The Cure-alls that Cure Nothing: A History of Patent Medicine” will be on display from March 1st 2019 – August 31, 2019.